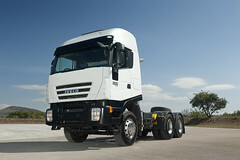 The Iveco New Daily 4x4 is equipped with permanent all wheel drive with differential lock. The torque distribution (32% on the front axle and 68% on the rear) is designed to offer perfect grip on any terrain. The first synchronised reduction gear can be selected (half speed) with the vehicle in motion, whilst the second reduction gear, for more off-road use, must be selected when the vehicle is stationary. Selection and disconnection of the three differential locks depends on the action of a control unit and, by using specific buttons on the dash, the driver can decide to activate them even with the vehicle in motion. New Daily 4x4 suspension is particularly suited to off-road use. The parabolic longitudinal leaf springs are highly flexible and have ample range. The axles, mounted on leaf springs, guarantee stability and traction in difficult off-road conditions. The telescopic shock absorbers and the anti-roll stabiliser bars, together with the live axle, allow for excellent performance on any type of terrain and slope without penalising load capacity.